We are always looking for enthusiastic people to help with our work. We have a range of volunteering opportunities for you to get involved with. We’re looking for volunteers across the UK to join us and help raise awareness of bowel cancer up and down the country. 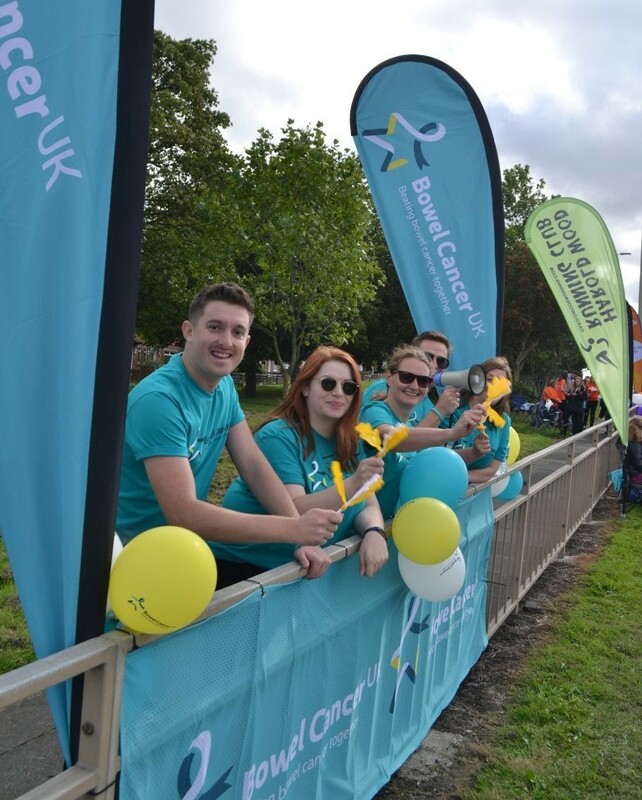 If you’ve been affected by bowel cancer, why not become one of our awareness volunteers and give talks about the disease to community groups and workplace? The talks raise awareness of signs and symptoms, risk factors and screening as well as highlighting your own experience. You can be located anywhere in the UK. Our volunteers include people of all ages, and you don’t have to have any previous experience of volunteering or giving presentations. A full day's training is given with plenty of time to practice the presentation, and we will support you every step of the way. We ask for a commitment of around one event per month but we welcome people who can give any amount of their time. Volunteer Helen Watson said: "I really love volunteering for Bowel Cancer UK because I feel so fortunate that I was diagnosed and treated early. Now I like to feel I am helping others overcome fear and apprehension if they have symptoms. I really hope my tale of doing the screening test encourages others to do it in good time. I also meet lots of interesting people when I give awareness talks and I feel Bowel Cancer UK staff really appreciate the work of their volunteers." The employees all found the volunteer’s presentation very useful and engaging, particularly because he spoke from personal experience. I think we all learned a lot about the symptoms. Fundraising volunteers offer vital support to our fundraising team. From cheering on fundraisers at running events to marshalling our walks or taking part in a street collection. Being a fundraising volunteer is fun and rewarding so please spare a couple of hours and join our team. We often look for people with experience of bowel cancer to volunteer and take part in focus group discussions in order to gain insight into patients' experience of their treatment and care. To find out more email volunteer@bowelcanceruk.org.uk or call 020 7940 1760. If you are London or Edinburgh based we often need volunteers in our offices. Let us know how you would like to get involved. To find out more email volunteer@bowelcanceruk.org.uk or call 020 7940 1760.